MILWAUKEE — A lie, it was famously said, gets halfway around the world before the truth has a chance to get its pants on. The deception in this story spanned half a century, and it kept Mary Jane Millehan from her real father, Tom Peters, from infancy until she was 51 years old. Well, the truth finally caught up, and this daughter and father have found one another and begun the loving relationship they missed out on all those years. “My whole past has been a lie, ever since I was born. There are times when I’m still really mad at her. I can’t help it,” Millehan said. She’s talking about her mother, who was born Carlotta Pucci and died Carlotta Hebblethwaite. In between, she was Carlotta Peters, married in 1960 to Tom Peters, a young fellow she met while both were students at the University of Wisconsin-Madison. Hebblethwaite, raised in Kenosha, Wisconsin, and known to friends as Lotty, got pregnant in spring 1963. What she didn’t reveal to Peters was that she was falling in love with another man. He learned the painful truth when he came home from work to their apartment, at that time near Rockford, Illinois, and found his wife and her boss at work and lover, John Hebblethwaite, moving her stuff out. The baby, Mary Jane, was just 10 days old and her mother whisked her away to a new place in Madison. “I mean, that would have been an Amber Alert now,” said Millehan, who today lives with her husband, Ron, in Roanoke, Virginia. She works in the insurance industry. “I was so shocked, I don’t remember saying much,” recalled Peters, a retired salesman who turns 80 this month and lives in the Milwaukee suburb of Brookfield. John Hebblethwaite had four kids in Madison and a wife he later left. Peters also worked at his food-service company for a while. As part of the divorce process, Peters went in for a paternity test. His estranged wife never showed up and no results were obtained. Over time, Peters was left with the impression that John Hebblethwaite was the child’s father, not him. His ex-wife never asked for child support. She appeared to want a clean break, and Peters was swept completely from the girl’s life. Peters married again in 1966 to a woman named Elaine. He adopted her daughter and the couple then adopted two babies in Texas where Peters worked for a while and two more children in Michigan where he transferred. They returned to the Milwaukee area in 1984. Meanwhile, John Hebblethwaite married Peters’ ex-wife when Millehan was 6, and his name was put on her birth certificate. Two of John Hebblethwaite’s sons lived with them. Carlotta Hebblethwaite did not bear any more children. Millehan was 19 when she married a Navy guy and moved to his hometown of Roanoke. They divorced six years later. She married her current husband, Ron Millehan, in 1996. They have no children. Not long after Carlotta Hebblethwaite died in 2014, Mary Jane Millehan was told by two of her mother’s close friends that the man that she had lived with for most of her life as a child was not really her father despite his insistence that he was. This confirmed what she had long suspected. She seemed so different from John Hebblethwaite, who died in 1997. Carlotta Hebblethwaite told the friends in confidence that her first husband was the father, but she never shared that truth with her daughter or anyone else. It was for the best, she insisted. 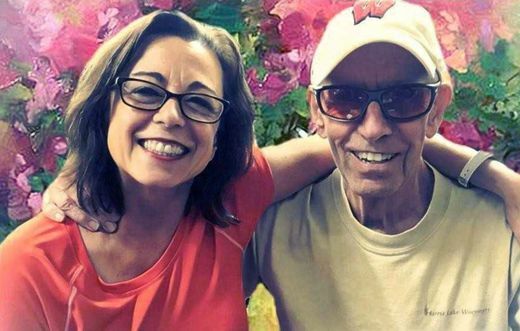 Peters’ second wife, Elaine, was diagnosed with Alzheimer’s disease in 2012. He cared for her at home for three years, and now she is largely unresponsive and in a memory-care facility a short drive from his home. He visits her every day. In his abundant alone time, Peters searched the internet for the whereabouts of Carlotta Hebblethwaite and found her death notice. Curious about the past, he then contacted her brother, Bernie Pucci, in Maryville, Tennessee. Pucci, who once had sent Peters a photo of Millehan as an adult, told him he long believed Peters to be the child’s father but decided to leave it alone. Pucci said confronted his sister, who told him that Peters was not able to father children because of a low sperm count, another lie. In September 2015, Pucci and his wife, Linda, gave Peters’ phone number to Millehan, and she called. They talked for an hour and a half, and soon they were chatting numerous times every day. They decided to remove all doubt and get DNA tests. The resulting probability of paternity: 99.99997%. “I rounded it off to 100,” Peters said, joking. They were thrilled. Millehan traveled in October 2015 to Wisconsin to be reunited with her biological father. They hugged and held hands and cried. She’s been back 20 times, and Peters has visited her a few times in Roanoke, about 200 miles southwest of the nation’s capital. Millehan returns Aug. 23 to the Milwaukee area for a party to celebrate her dad’s 80th birthday. “She’s brought so much joy to my life,” Peters said, especially at this difficult time as his wife slowly slips away. He said he’s getting too old to harbor anger over the way things went. ver the past three years, Millehan has sent Peters 68 thinking-of-you cards, which her dad keeps stacked up at his home.